Those of you who make streaming hosting know that accurate data is very important. That's why traffic was the first thing to calculate for our Daily stats reporting. Having this data, people requested us to make the next step and provide some basic billing capabilities to charge their clients more conveniently. And so we did it as part of our admin panel. Basically this feature consists of two major parts: setting billing parameters and reporting. 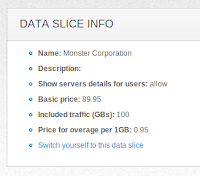 Billing calculation is based on data slices. This concept allows providing detailed information on chosen media servers and applications. You can watch a screen cast about this approach. 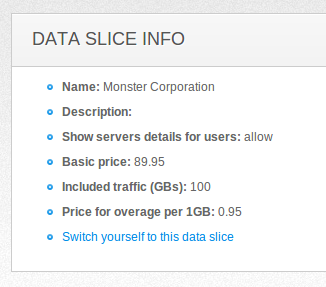 So now each data slice may have its own billing. Take a look at this slice edit page. Traffic included in basic price which is defined by client plan. Price for overage per GB in case all included traffic is consumed. So when it's set up you can go to "Reporting" top menu and click on "Billing information". This report shows all user-defined data slices with corresponding billing information per selected period. 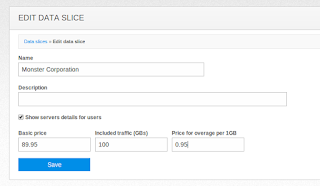 Total outgoing traffic calculated per slice daily stats. Basic price for the included traffic. Included traffic amount for the slice. Overage price for traffic over the included one. Under this table you'll get total amount of traffic and total amount of money you will get for it. So that's it. Use it for your own profit, it's free of charge. If you're new to our service, feel free to try it for 2 weeks free of charge. Billing capabilities are also applicable for Nimble Streamer, the light-weight HTTP streaming server for HLS, Smooth and progressive download. WMSPanel is an official GUI for Nimble Streamer.